Independently owned and operated since 1984, SANTA MONICA AUCTIONS presents unique and rare pieces by local Southern California artists as well as international art celebrities. SANTA MONICA AUCTIONS’ keen eye for resilient and relative artworks, live-internet bidding with www.liveauctioneers.com and an electronic catalogue to accommodate last-minute consignments solidify its reputation as a buyer’s sale. 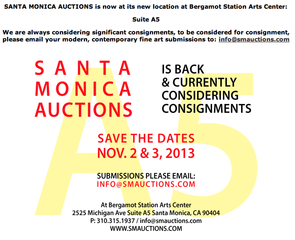 Our new location, suite A5 in Bergamot Station Arts Center is currently housing a preview of the auction. The continually updated online catalogue may be viewed at www.smauctions.com. Press inquiries and those interested in consigning fine artworks may contact SANTA MONICA AUCTIONS at info@smauctions.com or (310) 315-1937.